Finally, runners at all levels can improve their race times while training less, with the revolutionary Furman Institute of Running and Scientific Training (FIRST) program. 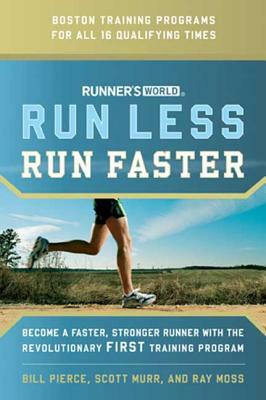 Hailed by the Wall Street Journal and featured twice in six months in cover stories in Runner's World magazine, FIRST's unique training philosophy makes running easier and more accessible, limits overtraining and burnout, and substantially cuts the risk of injury, while producing faster race times. With detailed training plans for 5K, 10K, half marathon, and marathon, plus tips for goal-setting, rest, recovery, injury rehab and prevention, strength training, and nutrition, this program will change the way runners think about and train for competitive races. Amby Burfoot, Runner's World executive editor and Boston Marathon winner, calls the FIRST training program "the most detailed, well-organized, and scientific training program for runners that I have ever seen." BILL PIERCE, a collegiate half-miler and experienced marathoner, is professor and chair of Furman's Health and Exercise Science Department. SCOTT MURR, an experienced marathoner and 10-time Ironman Triathlon finisher, is director of Furman's Fitness Center and a lecturer in the Health and Exercise Science Department at Furman. RAY MOSS, who designed the FIRST laboratory physiological testing protocol, is professor of health and exercise science and director of the Molnar Human Performance Laboratory at Furman.